For the first time ever, Brokk introduces its own hydraulic breaker series. It is a full lineup of no less than eight breaker models perfectly matched with Brokk’s full range of world-leading demolition robots. The combination guarantees maximum demolition performance to Brokk customers. The new Brokk Hydraulic Breaker (BHB) series of eight breaker models start with the 50kg light BHB 55 breaker for the compact Brokk 60 demolition robot, and then goes up to the 700 kg heavy and powerful BHB 705 for the recently introduced Brokk 500 and Brokk 520D demolition robots. 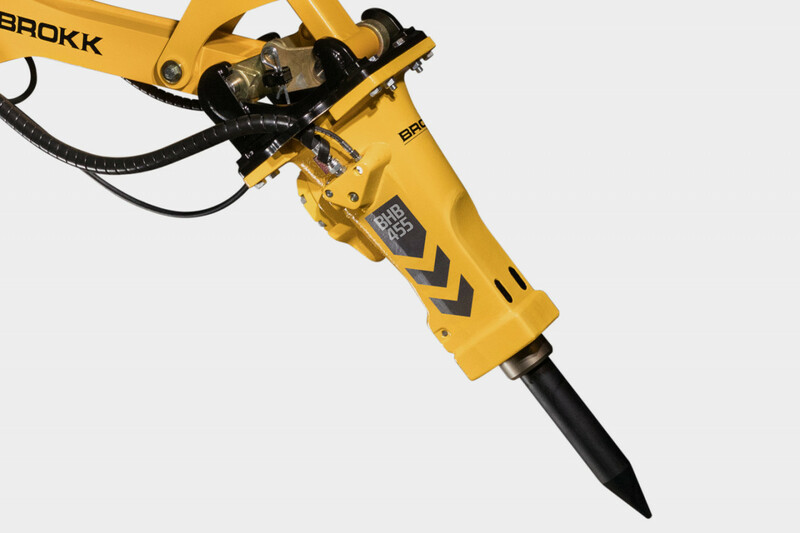 Just like Brokk’s demolition robots, a key feature of the Brokk Hydraulic Breakers is their power-to-weight performance. The breakers are lightweight and compact, yet powerful like heavier breakers from other brands. The new Brokk series of hydraulic breakers are perfectly matched with their respective Brokk demolition robot. And since the demolition robot and the breaker are designed to work at their respective peak effect together, Brokk now has the ability to deliver even more demolition performance from the Brokk machines. “As the leading benchmark in the industry for compact demolition, it makes sense for us to now take the step to introduce our own lineup of powerful hydraulic breakers to match the power and performance of unique demolition robots.”, says Martin Krupicka, President and CEO of Brokk Group. “By pairing our industry-leading Brokk demolition robots with their respective Brokk Hydraulic Breaker, we can assure maximum demolition performance for our customers”, Martin continues.